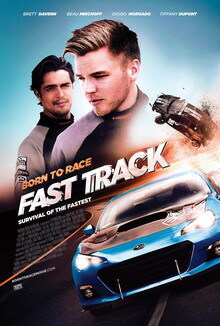 Buy or Rent Born to Race: Fast Track (2014) Movie DVD & BluRay Online! Movie Plot: Danny Krueger is a twenty-year old drag racer who plays by his own rules. After winning a scholarship to the prestigious Fast Lane Racing Academy, Danny finds himself competing against some of the fiercest young drivers in the world. Tension soars on and off the track, and a terrible incident leaves Danny without a racing partner. Facing dismissal from the academy, Danny is forced to team up with an old rival. The pair must learn to set aside their differences as they vie for rookie spots on a professional racing team.